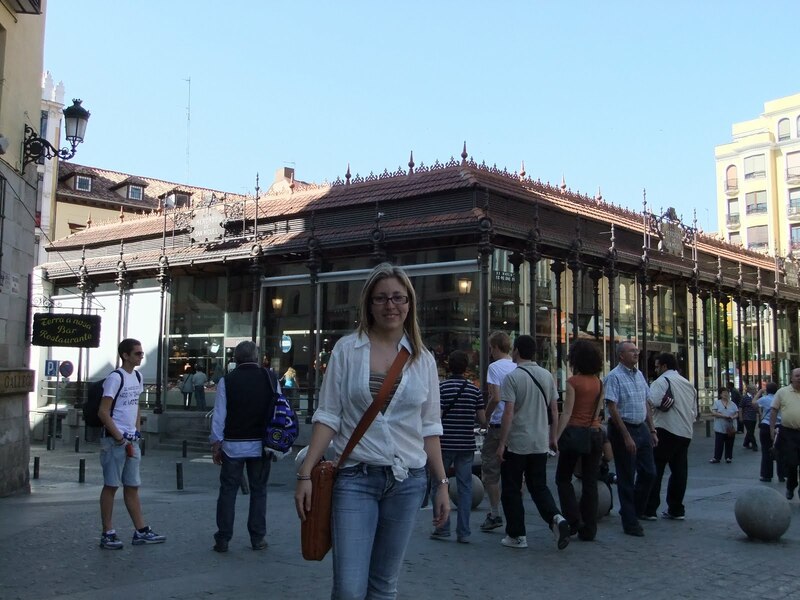 There's a song by singer and poet Joaquín Sabina called "Yo me bajo en Atocha" (I'll get off in Atocha - Madrid train station-); the place, Atocha, is sadly remembered by all of us because it was where the terrorist attacks of March 11, 2004 took place. 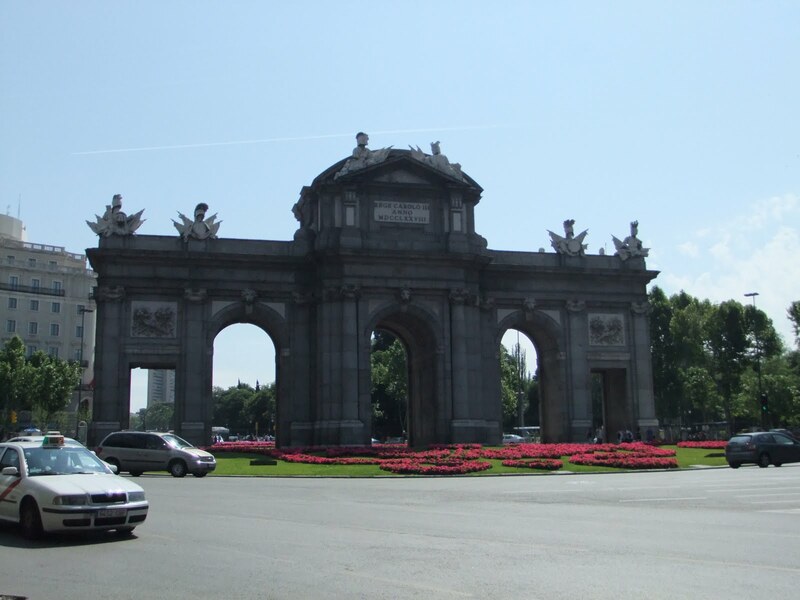 The song talks about the beautiful city of Madrid, its art, its monuments and its culture. - Cervecería La Fabrica - Calle del Jesus, 2 - Best tapas (called canapés), small bar near the Prado, discrete selection of wines & drinks, local environment - Must eats: canapés al salmon / pulpo a la gallega (octopus w/garlic, oil & paprika) / bacalao / jamón ibérico (best variety of ham in Spain). - Mercado de San Miguel - Plaza San Miguel, 1 - Historic site, it was an old market that has been rebuilt recently, inside you will find nice gourmeries where you can taste good fresh seafood, wine and oysters, just steps from Puerta del Sol - it's always crowded so be patient. - Cervecería Alemana - Plaza Santa Ana, 6 - Nice place to hang out in the city center, to get a cold beer and do some people-watching in the square. - For a drink and a snack, any bar in La Latina quarter, just pick the one you like. Hostal Bruña:definitely not a 5-star hotel, this cozy little family hotel is in a quiet square steps away from the Prado museum and Atocha train station. Don't expect pools or spa (or breakfast), but just a very clean, simple room with bathroom; which is all you need after a full day wandering around Madrid. There are some good bars in the area so meals are not a problem. Oh, and the prices are really good! The usual: Prado, Reina Sofía and Thyssen museums (all conveniently located not far from each other) - check on their websites when they offer free or reduced entrance fees; a walk in the Retiro park; typical sightseeing in Puerta del Sol, the royal palace, the Cibeles fountain, the Alcalá gate, etc. On the Gran Vía (Madrid's main street) you can find at least one shop of the main Spanish street fashion chains (which are a bit cheaper than in any other country): Zara, Mango, Bershka, Stradivarius, Pull&Bear, Oysho, Blanco, Women's Secret, Sfera, etc. On Calle de Fuencarral, a street off the Gran Vía, you can find other famous brands like Desigual, Adolfo Dominguez and other Spanish and foreign designers. Between Puerta del Sol and Callao squares you can find bigger shops and department stores like: El Corte Inglés, Fnac, H&M, etc. For boutique shopping (pricey), Calle Serrano is the destination. - Having a "quick snack" with a glass of Albariño and a delicious plate of pulpo a la gallega at Cervecería La Fábrica any time of the day. So, there's this group on Facebook for Mexicans in Italy, which I'm a member of, being half Mexican. Anyhow, I keep reading all their nostalgic messages, they miss everything: the food, the kindness of the people, even the chaos and pollution! Don't get me wrong, I loved growing up in chaotic Mexico City, it made me who I am and I left friends and family there but now I have a life in another place that I happen to love; therefore I have trouble understanding why people won't enjoy what they are living because they are too busy remembering old times. This brought to my mind a book I keep reading and reading over and over again (reading is another passion of mine) by Mexican writer Jorge Ibargüengoitia (1928-1983) called "La casa de usted y otros viajes" (Your own house and other travels). The book is a collection of articles written during his trips in Mexico and abroad and his early life in the Mexican countryside. In one of those trips he realizes how people (Mexicans in this case), when living abroad become so nostalgic about silly things; in Washington he meets a Mexican living there who is sighing for tequila, when Ibargüengoitia explains that he can get tequila in every grocery shop the Mexican replied: "yeah, but the lemon doesn't taste the same"...Nostalgia is irrational and irreparable, and it will always be superior to the solution one can propose you. In my opinion, if you want to live a happy life, it's a feeling you might want to keep in the bottom drawer. Enjoy the place you are living in, the people surrounding you and the tastes, the smells and the sounds of the place you now call home without forgetting where you come from, all those memories made you who you are but they shouldn't determine your future (I'm getting too philosophical, right?). Of course I miss tacos with a cold Pacifico beer, but I'll be enjoying my delicious pasta with a glass of Verdicchio! One of our (G, my lovely boyfriend, and me) passions is Sunday brunch, but not American style brunch (a plate of eggs, bloody mary, coffee and some fruit), we are talking about the Milanese style brunch: all-you-can-eat buffet (sweet and salty) + eggs or burger + coffee, and sometimes a glass of prosecco. For 18 20 Euro you get a mimosa (drink) on arrival, Nescafe coffee, buffet and a hot plate (eggs or burger). Buffet includes: cakes, fruit, salmon, cold cuts, pasta, salad, etc. The place is very nice, spacious and with good music selection, the area is very quiet on a sunday morning. They have two turns: 12,00 or 14,00, the quality of the food is very good, it has been our favorite since the begining. Being Bicoccans, we love to explore our modern and quiet neighborhood so Doris Diner is a must for those living in the area. For 18 Euro WOW they raised the price too much! I just checked and the brunch now costs 24 Euro! too much!!! you get a glass of prosecco on arrival, coffee, buffet and your choice of burger or hot dog (please, please, choose the burger!). Buffet includes: juices, cakes, pancakes, muffins, cold cuts, salad, etc. The place, that used to be an industrial loft, is a tribute to an American diner from the 50's, as if you were in Archie's favorite diner. The service is OK and the variety of the buffet is average, but the real deal here is the burger, delicious! big and tasty, with a side of french fries. (Warning: if you bring children, please, please keep an eye on them - that of course applies to every place you go!). We give it the 2nd place because of the delicious burger, because they include juice in the buffet and because we love their style. Try to go at 12,00 because it gets busy afterwards, since the buffet is in the upper floor you might want to be seated upstairs. We've always liked the big hotel buffet breakfasts (who doesn't?) and this is certainly one of them. For 27 Euro you get coffee and a huge buffet. Buffet includes: cakes, tiramisù, profiteroles, fruit, salmon, cold cuts, 2-3 different kinds pasta, salads, crépes, omelette station, roast beef, vegetables, etc. The place is very spacious, since it is a typical business hotel the atmosphere is a bit formal. It is kids-friendly, they have staff for kids entertainment so you can eat in peace while kids have fun drawing or doing something else than smashing plates (kidding). Quality of the food is very good, variety is great. Not cheap but definitely worth it. Perfect for a sunny spring/summer Sunday morning, since it is in the last floor of the Coin building, the view is nice, the air is a bit fresher. For 25 28 Euro you get water, a glass of juice, coffee and buffet. Buffet includes: omelettes, fish tartar, grilled vegetables, crepes, pasta salads, cous-cous, paella, pasta, meatballs, tiramisù, fruit, etc. The place is very nice, better to go on a sunny day so you can seat outside and enjoy the view, tends to get quite busy, though. Quality of the food, average, but gets some points for including tuna tartar in the buffet. For 27 30 Euro you get the buffet and one choice of main course. Buffet includes: burrata, paella, pasta salad, desserts, fruit, etc. There are two turns, 12,30 and 14,30 - make sure you get there by 12,30, otherwise you'll get the leftovers. Maybe the variety of the food is not as great as the other places but the quality here is superb, the burrata is the best! The place is cozy, in a nice pedestrian area so make sure you walk around after your brunch. There are many other places that didn't make it to our top 5, (like Dixieland and Julepp's) which are OK but nothing special; and there are other places we love but definitely shouldn't do brunch (like California Bakery: perfect for bagels, cheesecakes, etc- but not brunches - sorry but one dish with eggs is not enough); and others that are just lame and so not worth it (like T**lve and Lat****ino). We'll keep trying new places and maybe in the future we'll be writing about them. It's always a good time to talk about seafood. The weather has been so nice these days in Milan, so what better way to spend a Saturday morning than wandering around the quarter's market? And suddenly, there it is: the fish stand! Wonderful view, funny smell. What will we choose? 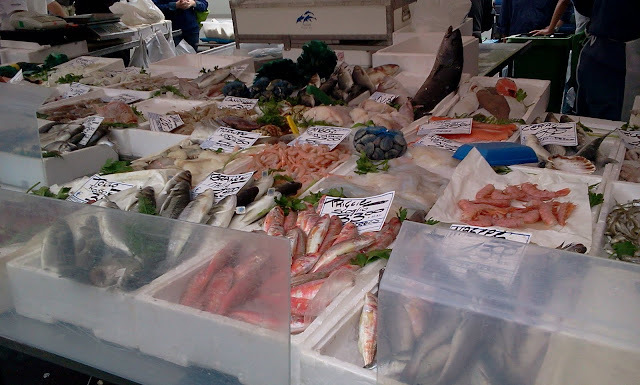 shrimps, oysters, tuna, salmon... all looks good! 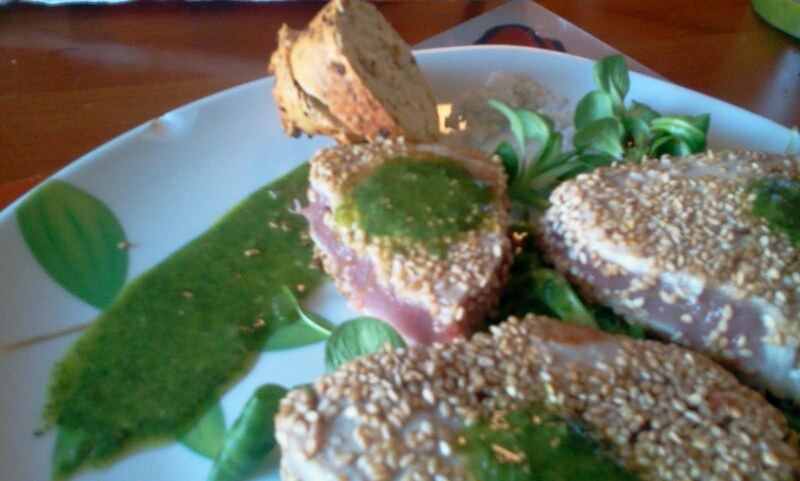 I must say I have a thing for tuna: raw, sashimi, seared, even canned! Wash the mint leaves and put them in the mixer together with the garlic clove 4/5 tablespoons of olive oil and some ground black pepper. Mix and add oil until you get the desired thickness. Prepare the plates: put some songino salad on a side of each plate, (add some julienne carrot) spray some oil and vinegar over it. On the other side of each plate pour some mint sauce, decorate with a spoon of coarse salt on a side. Coat the tuna steaks with olive oil, then press into the sesame seeds to coat. Heat olive a pan over high heat until very hot. Place steaks in the pan, and sear for about 30 seconds on each side. Serve the steaks over the songino and pour some mint sauce on top. Wine advise: Franciacorta spumante or Sauvignon Blanc from Trentino. Enjoy!